Current data indicates that about one-half to two-thirds of Americans are overweight and suggests that about one-third are obese. 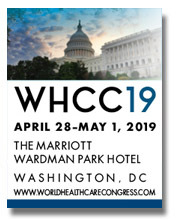 After 45 years of medical practice treating more than 40,000 patients in my office, I can affirm the validity of the data concerning the prevalence of obesity and the resultant diabetic, cardiac, and kidney disease. What is frequently not appreciated is the arthritic effect obesity has on our weight bearing joints; the hips, knees, ankles, feet and spine when they are overburdened by excessive weight. This is a serious health problem and frequent cause of disability. However, there are thousands of diets, weight loss, and exercise programs on the market as can be seen on the bookseller’s shelves. Why are they not effective? Why is obesity continuing to increase in nearly epidemic proportions? Why are the diet books proliferating despite their ineffectiveness? What is missing to make the human body healthy? We have designed this booklet to cover and unify what is missing. in a concise handbook fashion which is easy to read and to follow. The end result should be a normal weight, improved cardio-vascular system, improved musculo-skeletal system with a reduction in backache and joint problems and improved mental functioning. Thus, as you follow this handbook, you will enjoy an improvement in both physical (musculo-skeletal, cardiovascular, diabetic) and mental (cognition, memory, wellbeing) health. 1) retinopathy and blindness, 2) kidney failure (uremia), which then may cause hypertension and strokes, and 3) peripheral neuropathy or loss of sensation in the hands and feet, which results in injuries, cuts, bruises and infections from trauma which isn’t felt; and loss of circulation which may progress to gangrene and amputations. Therefore, many physicians consider that diabetes is the worst cardiovascular disease that humans acquire. The good news is that it can be controlled or ameliorated through early diagnosis, initiation of weight control and a low carbohydrate and sugar free diet, in association with a good exercise program started early in life. By starting this early in life, or when we first note a small amount of bulge around our middle, we can stem the tide to obesity and the numerous debilitating complications that it causes. In addition to the above multisystem diseases, obesity also causes many musculo-skeletal problems. Our joints are covered by a thin layer of cartilage which creates a permanent lube interface as the joint moves to support and move different parts of our bodies. If your weight is significantly above normal, this thin layer of cartilage will be compressed in all weight carrying joints. Over a period of time the cartilage may become so thin (or even disappear) that we end up having “bone on bone” which is like “metal on metal.” When we have bone-on-bone, it is equivalent to the brake shoes on your automobile wearing so thin that you have metal on metal. It becomes a very painful situation in our weight-carrying joints: the hips, knees, ankles, feet and spine. In orthopedics, this is called degenerative arthritis. In the joints, it is known as degenerative joint disease (DJD). In the spine, it is known as degenerative disk disease (DDD). These are very painful and disabling. They are also very costly and drive our insurance premiums upwards. These can essentially be controlled by maintaining a normal weight with morning stretch/flex exercises, aerobic activity, and muscle conditioning. A healthy body is also a condition that creates a healthy mind. 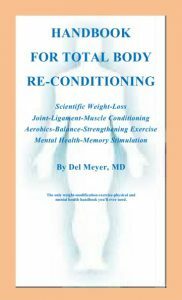 We have included mental and memory exercises in this handbook for a total body and mind re-conditioning program. This Weight-Loss-Exercise-Total Body Reconditioning Handbook may be the most important information for your physical and mental health that you have ever read. It is written in a straight forward fashion, so it will be easily understood. It is in Digest Size and soft cover which makes it easy to carry with you for easy reference as you shop, travel or even dine out. You can download it into your I-pad, I-pod, or laptop so that you can easily access the references directly from the web with one-click. This makes important information available to you in all aspects of your life and further enlarges your understanding of the totality of your problem.